Douglas Max Utter was born December 8, 1950 and was raised in Cleveland Heights. 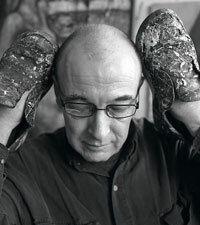 He attended Case Western Reserve University and has been a self-employed writer and exhibiting artist since 1986. He has on various occasions taught painting and drawing courses at the University of Akron, Kent State University, and the Cleveland Institute of Art. He began writing criticism and commentary on the arts in 1988, and since then he has written weekly reviews and commentaries as art critic for Cleveland Scene Magazine (formerly the Free Times). He has won awards from the Cleveland Press Club, and over the years has received two Fellowships in the field of art criticism and from the Ohio Arts Council. Over his career he has hundreds written hundreds of reviews, articles, and catalogue essays. In 2003 Doug co-founded Angle Magazine (2003-2007), and has also been a managing editor of Artefakt Magazine (2004-2005). From 2005-2008 he organized shows and publications as Exhibitions and Collections Coordinator for the Artists Archives of the Western Reserve. His interest in art stemmed from childhood, when his first crayon on paper works tended to be narrative; he even chronicled the tale of Sleepy Hollow. His earlier art education was mostly self-taught, and in his roundabout style he went to museums and libraries to teach himself about the history of painting. His early work made a major jump after Doug absorbed the lessons of early abstract expressionism and combined these with aspects of pattern and decoration movement. His paintings became bigger in emulation of the Transavantgardia and American Neo-Expressionism. Since 2002 he has poured paint onto canvas in an attempt to push the painted surface toward the eye, thus re-measuring the distances between the illusions created by drawing and the more three-dimensional, bumpy features of other surfaces he used. His new work contains landscapes with clouds and storms, as well as many heads – in an attempt to push across real space toward the eye. His paintings are about presence and urgent encounters, as well as loss, absence, and memory.